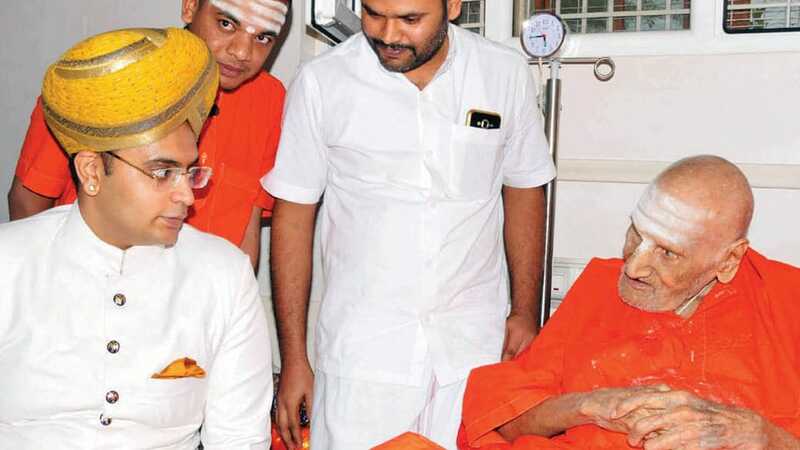 Tumakuru: Yaduveer Krishnadatta Chamaraja Wadiyar called on Dr. Sri Shivakumara Swamiji of Siddaganga Mutt here yesterday. The scion of Mysore Royal Family, who visited the Mutt for the first time since his coronation, discussed issues related to drought, monsoon failure and also about his grandfather Jayachamaraja Wadiyar visiting the Mutt during 1948. The meeting went on for about 20 minutes. Later, Yaduveer interacted with students and took part in the evening prayers. Yaduveer had recently visited the inauguration of Hucchu Basaveshwara and Bolu Basaveshwara Temple at Kambalu near Tumakuru and it was at this time that he was invited by the Siddaganga Mutt’s Junior Pontiff Sri Siddalinga Swamiji to visit the Mutt.